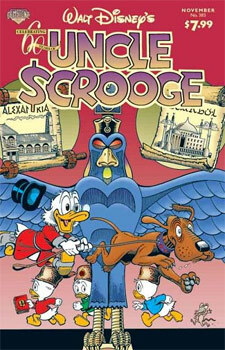 The search for the famous Lost Library of Alexandria is on again in the latest issue of Uncle Scrooge. Issue #383 in the series reprints Don Rosa’s masterpiece Guardians of the Lost Library for the first time in the United States since fourteen years. This time the story is accompanied by unused, finished panels Rosa dropped from the story and replaced after its initial European printing. Two articles by Don Rosa tell about the story’s origins and the research that went into the making. The beautiful Rosa cover and a new Christmas back cover poster by Don Rosa make this an issue not to be missed. It is on sale now for $7.99 at Amazon and your local comic store.